Variability exists in the treatment of depression in children and youth, suggesting a lack of agreement among frontline clinicians as to best practices for managing this condition. Clinical practice guidelines (CPGs) provide evidence-based recommendations that help guide and inform decisions about assessment, prevention, and treatment of a problem or condition; however, little is known about the quality of CPGs in the field of child and youth mental health. The Cundill team developed a 2-page decision aid (pictured below) that is based on the NICE guidelines and that can be modified appropriately for different environments. The decision aid is meant to guide nurses, paediatricians, psychiatrists, family physicians, psychologists, social workers, occupational therapists and other members of interprofessional health care teams in making treatment decisions. 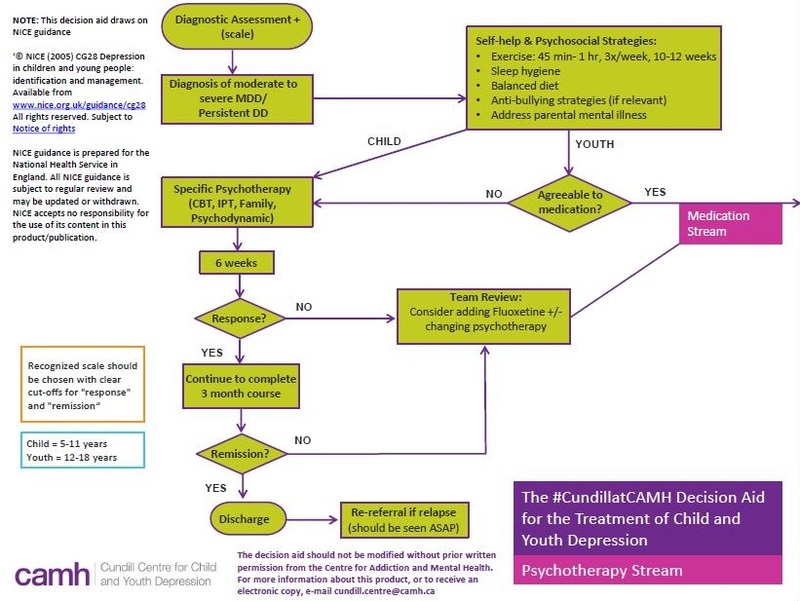 Contact cundill.centre@camh.ca for a PDF copy of the decision aid, or to discuss implementing the guidelines in a particular setting. By implementing high quality clinical practice guidelines, clinicians can increase the use of effective interventions, minimize harm, and avoid wasted resources.